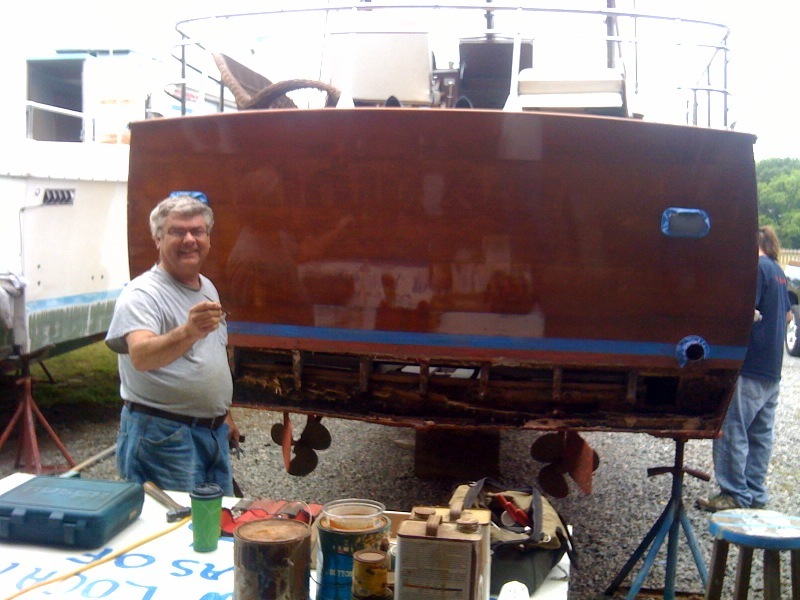 Krunch putting on the final coats of refresh varnish for Sylvia. Note the Jag coupe work bench on the right. Below is the setting. Wino Signs in Woodyboaterville is full this time of year. That’s a Tolly Craft and Matthews in the background. There is also a very cool Spartan Trailer behind the Matthews. It’s all about team work and good pals. Above is master boat guy Russel showing one of the Rudder bolts that was broken in half. 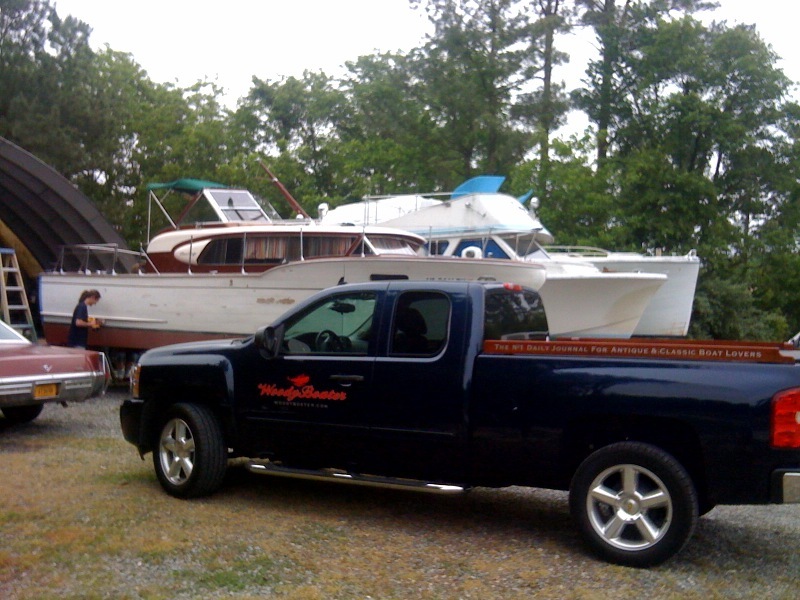 After sticking a screw driver through the transom base it seemed like a good idea to address the issue. 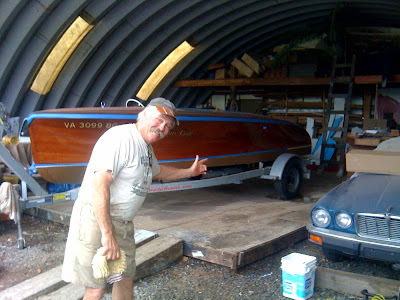 The good news is that every other part of the boat is sound…ish There is one plank that needs some attention but thanks to all the previous owners and Betsy’s manic need to have a perfect sea worthy boat she is still in great shape. And now I feel a tad more secure that at least one of the most common areas of distress is addressed. Here is master sander and heir to the Krunch empire, Calhoun. The official Sand Varnish Woody Boater shirt looks better with dust all over it… mmm Maybe next years t shirts will all be dusted before shipping. We will be announcing the big name winner tomorrow. So stay tuned. Vintage New Life Vests. It&#039;s About Time! Barn Wood III- Smitty&#039;s Return. 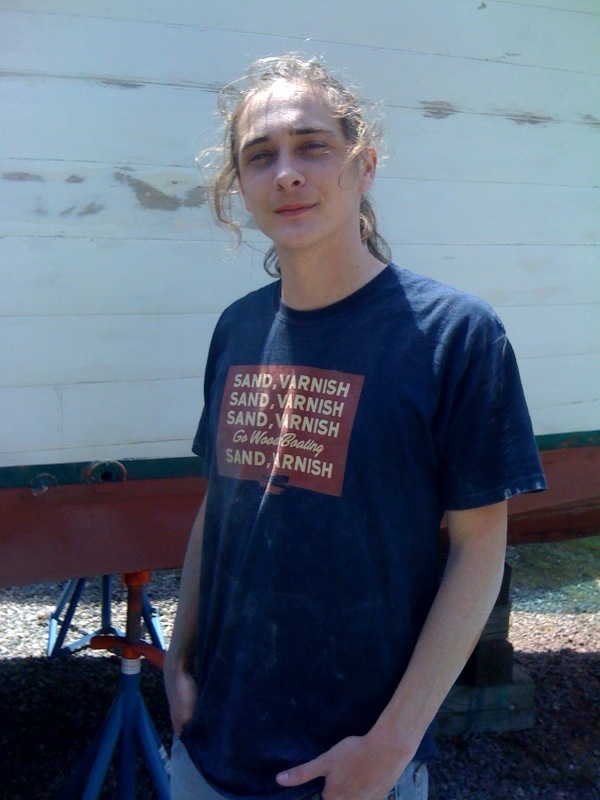 Can one still buy a sand/varnish T-shirt? I want to present one to a friend that deserves one? I couldn't find a link….shoulda bought one at Tavares I guess.